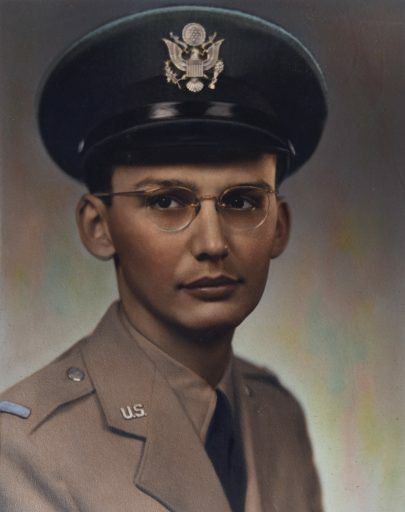 Henry Berner Jones Jr., ’50, was born in Gray, Georgia, on May 9, 1927, but his birth would be one of the only times family and friends would use his full name. The only physician in Gray, Georgia, for about 35 years, Dr. H.B. 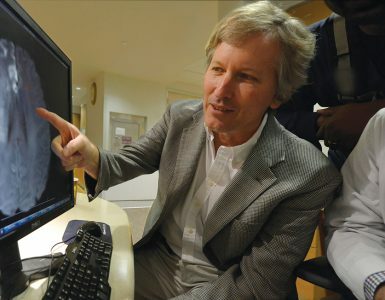 Jones never forgot his roots or the medical school that made his life possible. 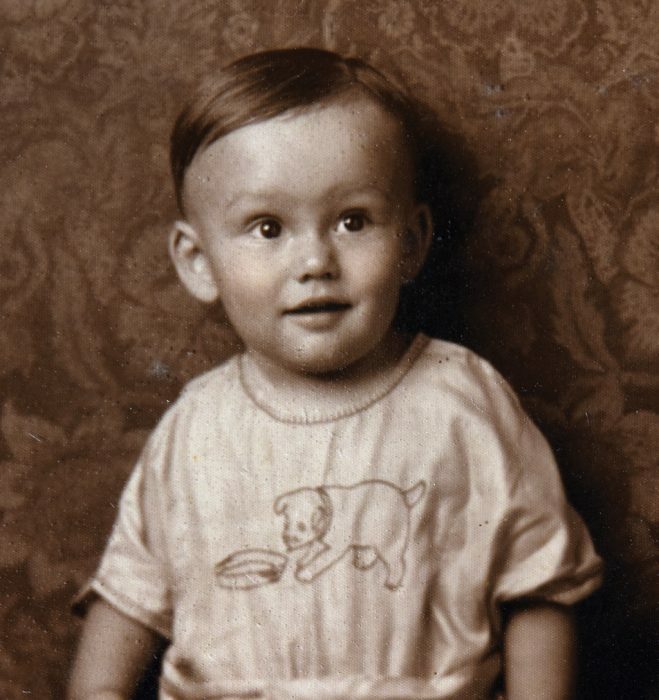 Henry Berner Jones Jr., ’50, was born in Gray, Georgia, on May 9, 1927, but his birth would be one of the only times family and friends would use his full name. To his family, he was always H.B., and then later, Dr. Jones. “That’s just what you did,” said second cousin Danny Greene with a laugh. “He didn’t tell you that you had to call him that … He just commanded the respect of folks, even family members.” Even his mother, Lutie Mae Greene Jones, was only heard publicly to refer to him as “The Doctor” in his adult life. Lutie Mae and her husband, Henry Berner Jones Sr., would divorce when H.B. was just 2 years old. The young mother, one of a family of 12, didn’t go far: She moved back home to the sprawling white-framed house where she grew up and worked as a postal clerk at the Gray P.O. and also took in sewing to make ends meet. As an only child to a single mother, it’s no surprise that Lutie Mae and her young son were very close. “His mother supported him, and he supported his mother,” said Greene’s sister Nancy Nash. “It was that family of two.” And it’s likely her example of hard work that influenced him all throughout his life. Even as a child, “he was always very studious,” said his first cousin Janelle Bridges, who says Dr. Jones was like a brother to her. It was also the Great Depression. “It was very hard,” said Bridges’ sister Marilyn Sauls, who remembers those frugal days well. H.B. had a paper route and also pumped gas as a teenager to help make ends meet — “although I can’t picture Dr. Jones pumping gas,” laughed Greene. “But you had to do what you had to do,” said Lynn Nelson, who along with her husband, Brick, were Dr. Jones’ business associates and friends. He had come off his paper route and came in and found his grandmother. He came up to our house and said, ‘Grandmother’s sick, come.’ Then Mother took me and Janelle down there to see what had happened. He had come in and thought she was playing a trick on him, that she was [pretending to be] asleep and wouldn’t wake up. I’ll never forget that picture as long as I live. Maybe that sparked [his] medical interest. The solemn little boy grew up to be a slim, serious teenager sporting round glasses and a neatly combed hairstyle, part of the class of ’44 at the new Gray High School. The solemn little boy grew up to be a slim, serious teenager sporting round glasses and a neatly combed hairstyle, part of the class of ’44 at the new Gray High School. According to Greene, “One of his teachers wrote to him in later years to recognize him for his ‘wonderful brain and temperament for humanity.’ She also declared that she knew he possessed what ‘only a few are given — mentality and humility.’” Although the high school offered a strong curriculum of English, history, literature and social sciences, its weak-nesses were math, the natural sciences, chemistry and biology. But it also had teacher Louise Morton, who took it upon herself to study the sciences so she could mentor students who wanted to go further in those fields. One of those was H.B. “He told me so many times — and Janelle too — that that’s the only reason he could have become a doctor is because he got the science and the math from what Mrs. Morton had studied,” said Sauls. At only 17, H.B. enrolled at Emory University’s Junior College at Oxford — and Nash points out that he was one of the first of the Greene family to extend his education beyond high school. 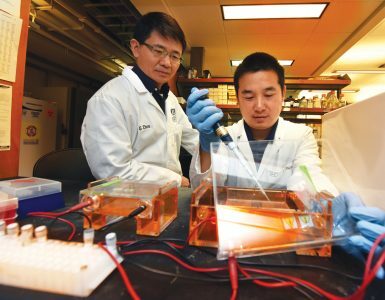 He continued to pursue science while he was there, sticking to the university’s rigorous study schedule of 7:30 a.m. to 11:30 p.m. for six and one-half days a week. But the self-described bookworm still managed to cut loose, at least on Saturday afternoons. He and fellow students would each pay 10 cents to pile into a taxi headed for downtown Covington, two in front and nine in back, where they would hang out at the local drugstore or catch the latest movie. His family isn’t sure why H.B. 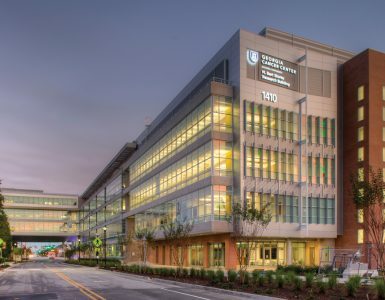 chose the Medical College of Georgia to further his growing interest in medicine. It may have been its convenience to his hometown — just about two hours away by car — or the cost may have appealed to his frugal nature. An internship at Macon Hospital (now Navicent Health) followed, before H.B. was assigned to Alaska during the 31 months that he served in the medical corps of the U.S. Air Force during the Korean conflict. He wrote to his mother often during those months, asking about his uncles and aunts, talking about the cold and how the wind blew all the time, but there wasn’t much snow. The time spent in an environment so different from the balmy South likely gave him a love of seeing new places, one that he wouldn’t be able to indulge again until after he retired. He came back to his roots. Jones County needed a doctor when Dr. Zachary died. And it may be as simple as this is where his mother was. I felt like he looked after his mother and he had a commitment to the community. And he had the support of his family — he could come back and practice on his own relatives and have a good practice! Roughly 40 years after his graduation from medical school, at his retirement in 1991, his cousins Janelle Bridges and Marilyn Sauls threw him one of the largest parties ever in Gray and its surrounding areas. 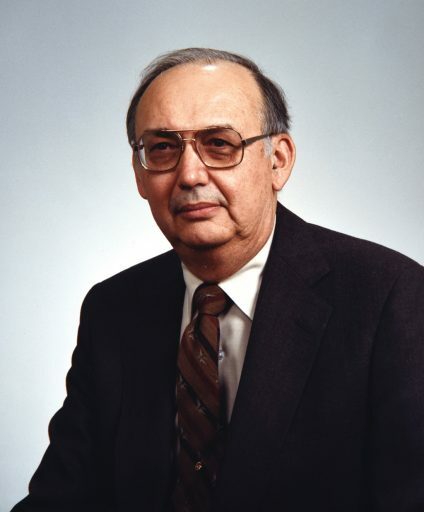 As the only physician in his hometown, Dr. Jones covered the lifespan of his fellow citizens for about 35 years, doing everything from pediatrics and geriatrics to minor surgery and even X-rays, which he read himself. He made house calls, usually in the latest-model car — of which he maintained two, just in case one wouldn’t crank up. And he saved the lives of at least two family members and likely others during emergencies, one from an accidental gunshot in the stomach and the other from a life-threatening reaction to a yellow jacket sting. “He was the true definition of a country doctor,” said Brick Nelson — “but he wasn’t country,” added his wife, Lynn. “He would take care of you if he could, but he knew also when you needed to go somewhere else and he knew right where to send you,” said Nash. “He was very explicit with his directions,” said Greene, “and as he made his decisions, very thoughtful, very methodical” — “not chatty,” agreed Nash. 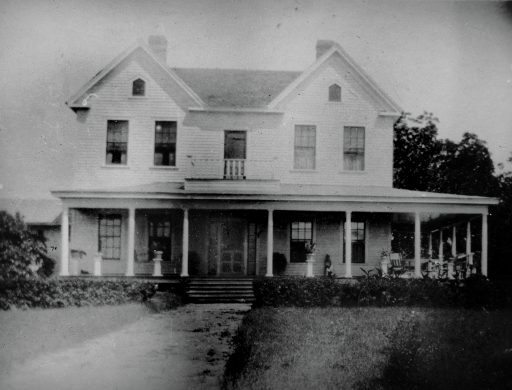 Jones grew up in the same home where his mother was raised. His chuckle was in full view of the whole town of Gray one night when he and other local men put on a “Womanless Wedding” as a fundraiser for the Kiwanis Club sometime in the late ’50s. The phenomenon has its roots in the South, according to a story by National Public Radio, beginning in the 1920s, where men would dress up to play all the parts of the wedding party, including the bride, bridesmaids, flower girls and mother of the bride, taking care to “ham it up, kissing audience members of both genders, flashing garter belts, adjusting whatever passed as breasts and, in general, just being naughty,” wrote historian Craig Thompson Friend in his 2009 book Southern Masculinity. “Dr. Jones put on a dress and he couldn’t have worn his mother’s dress because he was tall and his mother was so small, but I remember it being a pink dress, but he had on one of his mother’s little hats,” said Danny Greene. “And our father, who was in the wedding also … came by Dr. Jones and pretended to fall down, and as he fell down, he had a pair of pink bloomers in his purse, and he threw them up in the air because it looked like he had fallen and lost his pants, but they came back down and landed on Dr. Jones’ head. So he sat there with those pink bloomers on his head, and his shoulders just shook. No response, other than his shoulders shook and he smiled and that little chuckle that he did. He didn’t quit practicing until there was another doctor in town. He kept on until there was a replacement … he would not have deserted the ship under any circumstance. 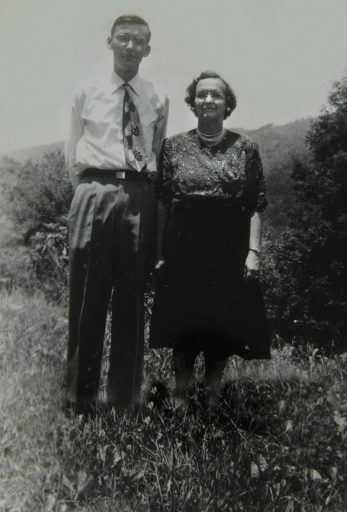 Jones and his mother, Lutie Mae Greene Jones. “We talked about him being married to his practice, to the field of medicine. And the medical college provided all of that,” said Brick Nelson.